Looking for an affordable replacement to your old-fashioned HPS grow light system? Then this BestVa 2000W LED grow light review is the answer you’re looking for. I discuss how you can replace your 1400W HPS grow light system with this BestVa 2000w DC Series grow light. I’ll cover all the essential factors you need to know when buying an LED grow light, and hopefully this BestVa 2000w is right for you. If not, that’s okay because I’ve also reviewed a ton of other LED grow lights on our home page and you’re bound to find a good match over there. What are the essential factors you need to know when buying a grow light? I intend to discuss LED type, PAR reading, grow space coverage, power usage, warranty, and more. 1.2 Build – Is It Strong Enough to Last Long? 1.3 Spectrum – Is it Suitable for My Marijuana Plants? 1.4 Energy Efficiency – Is the BestVa 2000w grow light a Power Hungry Grow Light? 1.5 Coverage – Is It Suitable For My Grow Space? 1.6 Cooling – Will Temperatures be Balanced Inside Your Grow Space? Any product can only be a success if its manufacturer is committed to providing quality and value to its end users. In the same way, before getting familiar with this Bestva DC 2000W LED Grow Light, we’ll get familiar with the brand that manufactures this grow light for indoor gardeners and cultivators. Shenzhen King Lighting Co. is the parent company and manufacturer of the brand called BESTVA. They’re a leading grow light and lighting fixture manufacturers. Also, they’ve their manufacturing unit in the Guang Dong, China. They’ve established their own identity by supplying high-quality products like double chip also known as DC series, Elite series, and Smart Series grow light for indoor gardeners and marijuana cultivators. This brand is providing grow lights and lighting fixtures to the all level of cultivators. Moreover, they’re satisfying the hearts of their users since 2011 and it’s 2019 already so you can imagine level of expertise in their products. Yeah, they’ve highly experienced staff, and they’re providing correctly tested products for past 8 years. Now, enough of the introduction of the brand. Let’s move forward with other features of this Bestva DC Series 2000W LED Grow light in this review. Build – Is It Strong Enough to Last Long? Its strong enough to last 100,000 hours. That’s double the expected life of many other LED grow lights on the market. A BestVa 2000w user can expect a decent uptime and quality light for 5-7 years. Starting from the outer body of the grow light to inner boards and chips are manufactured using reliable and high-quality materials. 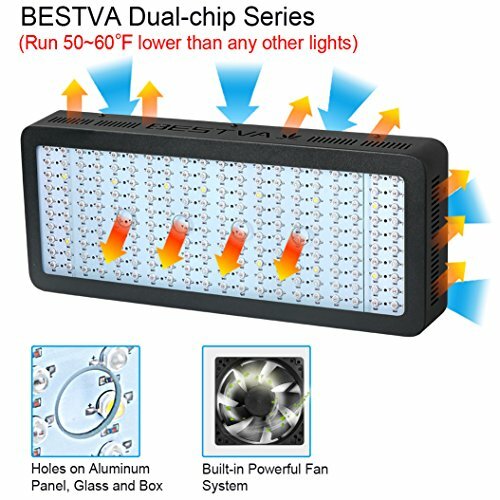 The BestVa 2000w utilizes dual-chip 10w LEDs, which are brighter and more efficient that 3w and 5w LEDs used on many other LED grow lights. Bestva DC 2000 Watt grow light measures in at 21” X 8.5” X 2.3”, and it weighs around 10.36 pounds. That’s a considerable size light, so you may be wondering how much coverage you get for that size. 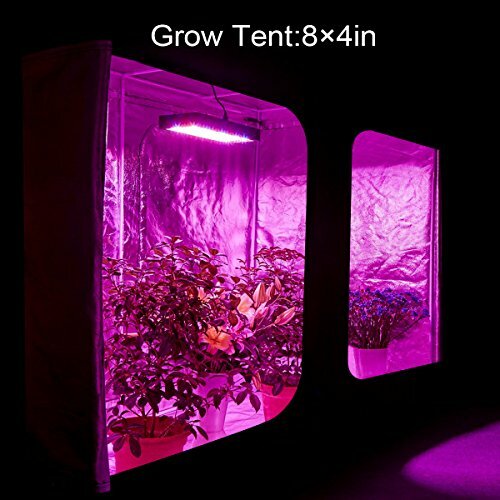 BestVa states a 4×4 coverage area, although one reviewer claimed her BestVa 2000w grow light covers a 5×5 grow space with ease. Of course growing is just as much of an art as a science, so it’s up to you to find out what works best. If you have a larger grow space you may want to consider purchasing the right number of lights based on their respective coverage area. The Bestva DC 2000W is not a waterproof grow light, and you’ll have to keep it away from dripping water. They do make waterproof LED grow lights but they’re hard to find with high levels of wattage. Spectrum – Is it Suitable for My Marijuana Plants? Bestva DC 2000W LED Grow light is equipped with 200 LEDs of 10W each. These are dual chips LEDs and works well and generates more intense light while working. This dual chip diode also helps in reducing excessive power consumption. Even though 10 watt chips are utilized, they’re actually more efficient due to their brightness. 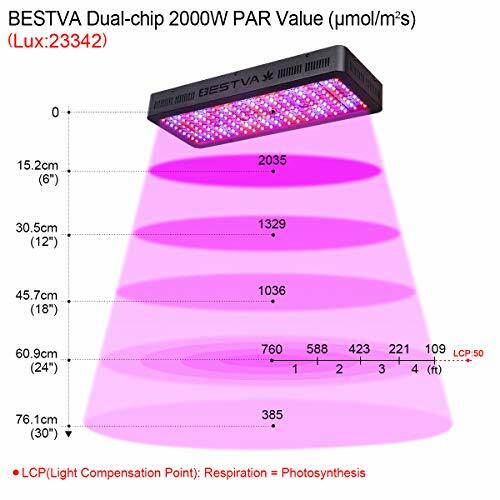 As far as spectrum is concerned this double chip LED grow light by Bestva spreads a full spectrum light over your plant canopy. It includes the most essential UV and IR light bands to help your plant survive better and sustain continuous better growth. Spectrum composition of the Bestva DC 2000W LED grow light consists of color bands ranging from 380nm-780nm where warm and cool white will be supplemented by light at 3500K and 7000K respectively. LEDs are set to 120 degrees which will spread light evenly on your grow space and will avoid any harm that has been noticed while using direct angle LEDs. Moreover, this focusing angle also increases the light penetration rate of your marijuana plants, resulting into improvised health and greener leaf and happy plants. The incredibly intense and bright light from this BestVa is capable of improving health and growth of your cannabis plants. Well-balanced ratio of blue and red LEDs help to improve the process of photosynthesis which results in more energy and essential sugars to your plants. When it comes to spectrum you can compare the BestVa 2000w to any affordable COB LED grow light on the market. It’ll amaze you with its capability. Quality of light generated by this Bestva 2000W LED can be used uniformly for all the phases of your marijuana plants lifecycle. 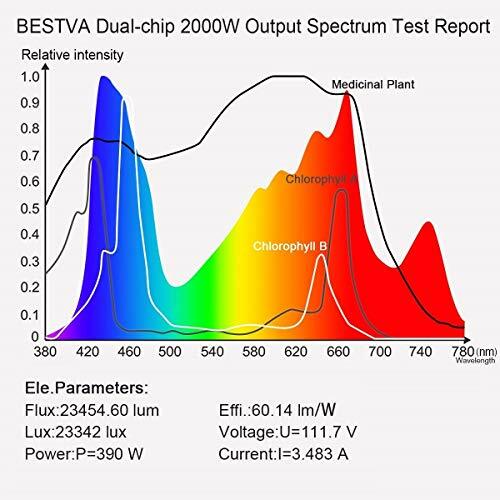 Energy Efficiency – Is the BestVa 2000w grow light a Power Hungry Grow Light? No. It’s not a power-hungry grow light. Despite being labeled “2000 watts,” that’s the output equivalent wattage. Your BestVa will only draw 390 watts from your outlet. Instead, BestVa DC 2000W helps you save a lot while raising your marijuana indoors. The PAR ratings are impressive considering the 390w power useage. This grow light can deliver 760 uMol readings from the height of 18”. What does that mean for you? As we mentioned earlier, any plant within the 4×4 to 5×5 coverage area will absorb a sufficient amount of light to carry it to maturity. For Lumens output you can expect around 20K lux output as per the majority of existing user’s opinion. Even at this low power consumption, you can replace a power hungry and an average HPS system of 1400W with ease. One reviewer replaced two HPS 1000 grow lights with FOUR BestVa 2000w grow lights and reported using HALF the power. Now that’s amazing. Coverage – Is It Suitable For My Grow Space? Now, comes the essential factor of Bestva 2000 Watt LED Grow Light. As far as the coverage area of Bestva 2000W grow light is concerned, it can cover an average of 4’x4′ feet of grow space from the height of 24” with ease. However, several users have reported that footprint can be found in that much area, but for potential results, it should be used for 4’x4′ ft of grow space. Also, another few cents from our side is keep it nearer to canopy during flowering to get the best quality and high yield from your weed plants. Well, Majority of existing users are happily using it and recommending it to fellow cultivators. You may check the reviews of its existing users here. If you don’t have this much coverage area then we’d suggest you to go for a small grow light and we’d suggest you to read our Viparspectra Reflector Series 600W LED Grow Light Review. Cooling – Will Temperatures be Balanced Inside Your Grow Space? As far as temperature management is concerned, Bestva designed this grow panel in a very scientific way. The BestVa 2000w LED grow light features four powerful fans as well as holes on the aluminum panel and the glass to help heat escape. BestVa claims this light runs 50~60℉ lower than other lights of comparable power. Pretty impressive. In short the Bestva 2000W Grow light itself runs very cool and doesn’t produce much heat, ensuring a well-balanced atmosphere for your growing plants. You may also check reviews of Bestva 2000W Dual Chip LED Grow light by its existing users where a majority of them are happy with heat management of this grow panel. These highly satisfied customer base makes it one of the best budget friendly LED on the market. The manufacturer has stated working temperature from 68 to 104 degree Fahrenheit which is bearable from a grow light in this price segment. 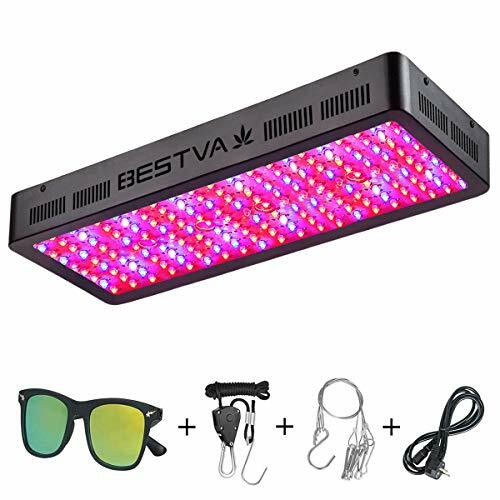 Your BestVa 2000w LED grow light won’t just be an investment for the short-term, you’ll be spending your money on getting results for the longer time. Also, as it’s electrical equipment we could expect rare occasional failures or problems from the product. One user reported such an incident in their review, but stated that customer support reached her within hours, promptly sent a replacement, and kept her updated about the status throughout the whole process. BestVa is providing customers service that makes you feel valued. What could be a more satisfying feeling from a manufacturer? Also, in the case of Bestva 2000W LED Grow light, you shouldn’t be worried about customer service support. BestVa is also known for a high level of customer satisfaction. Yeah, Bestva provides 3 years of satisfactory customer warranty along with a 30-day satisfaction or refund policy to ensure their customer a safe investment. These are all the features of this fantastic piece of satisfaction in this Bestva 2000W LED Grow Light Review. Now, take a look at Advantages and Disadvantages of Bestva 2000 Watt Full spectrum LED Grow Light. Let’s start with the bright side of this masterpiece. A Complete Full spectrum Effect. Can be controlled using the timer. Best in the segment coverage area. A well-balanced ratio of Red and Blue light. Fabulous replacement for 1400W HPS system. Uniformly suitable for all phases of Marijuana plants. Capable of keeping the well-balanced temperature inside grow space. 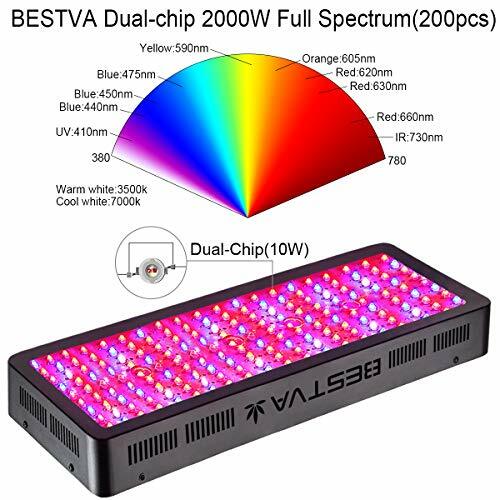 Now, as we’ve seen all the important aspects of this fantastic full spectrum grow light, it’s time to conclude this Bestva 2000W Dual Chip LED Grow Light Review here. What You’ll Get In The Box? If you’re looking for a perfect yet affordable replacement for your power hungry and old-fashioned HPS system, then Bestva 2000W Full Spectrum LED Grow Light is the best bet for you. This grow light is capable of providing the quality light to your cannabis plants. Also, a footprint that can be obtained using this grow light by bestva is impressive. It is providing best in the segment coverage to your marijuana plants as far as price is concerned. To save continuous expense on electricity and to get as much as possible in return you may surely go for this grow light. I’d recommend BestVa DC 2000W grow light to those who want to start indoor marijuana cultivation with a grow space of around 4’ X 4’ to 5’x5′. Also, to those who don’t want to make a hole in their pocket by buying premium grow lights available on the market like G8LED or Platinum LED Grow Light.